The 162 takes and keeps an excellent edge. The S30V blade is strong and up to any task. Handy for baton work and all bushcraft chores, but not too shabby at some of the finer work if needed. Verdict: The Benchmade 162 is a quality sturdy knife that fits well in the hand. Nice handle made from G10 that gives you plenty of grip options. A vast array of uses for the knife and with the full tang blade you can give it a lot of hardship. This knife feels like the quality tool you expect from Benchmade. With its razor sharp blade you can make paper thin feather sticks or hack into something much harder. You decide but with this knife you get the best of both worlds in a single knife. You will have no issues striking a ferro rod off the spine either to get the fire started. Feels firm in you hand because of the strong large handle. Suits somebody with bigger hands. A couple of points of note with this knife. Keep it sharp and check the blade often. It comes razor sharp out of the box and is very hard but don’t let it get dull when in the field. One user had an issue with the sheath not being protected from the blade but fixed this with a bead of epoxy along the inside. Great knife. Feels great in the hand. You know you have quality when you work with this blade. Keep the blade sharp and you are good to go. Comes complete with its own sheath with room for a fire rod. 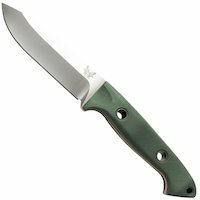 A bit more pricey than some of the other knives here but a solid piece of gear all the same.